It’s getting hot in here! The rising temperatures often results in more water usage both in and outdoors. Families have been estimated to use 25-50% more water during the hottest months of the year. 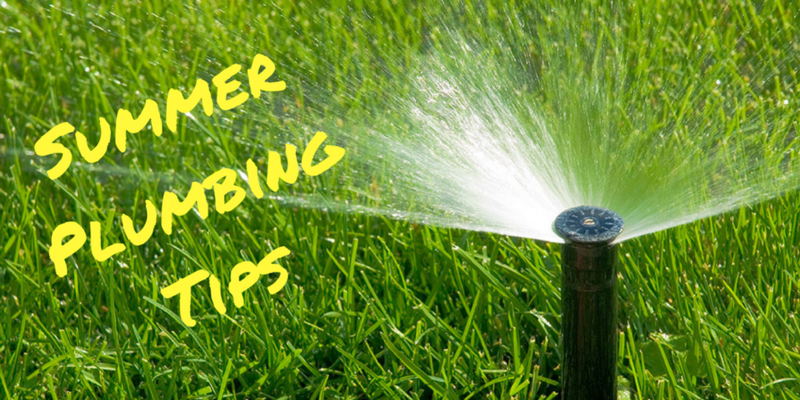 We want to help our customers save money, so here are some helpful tips to follow this summer to not put so much pressure on your plumbing. If you’re vacationing away from your home for several days, turn down your water heater to save energy. It’s also important to know that the average life of a water heater is anywhere from 8-11 years old. If you don’t know the age of your system, check the last four digits of the serial number on the tank. This will show you the month and year it was manufactured. If you are entertaining and having people over for a cookout or get-together, make sure the food doesn’t end up down the drain. A clogged garbage disposal is no fun! Water your lawn at the right time! We suggest that the best time to water lawns and landscapes is in the early morning or evening after the sun goes down. If you chose to tend to your lawn in the middle of the day, that water may be lost due to evaporation from the heat throughout the day. More outdoor fun means more dirty clothes. Be sure to check your washing machine hoses for bulges, leaks or cracks and be sure to remove dryer lint regularly. Remember, washing machine hoses should be replaced approximately every three years. Every season brings a new challenge to your plumbing. In order to stay away from complications, make sure to read up on ways to protect your plumbing for each season. We are glad to give our customers some friendly tips for the summer. Remember: we’re the name to know when it won’t flow!